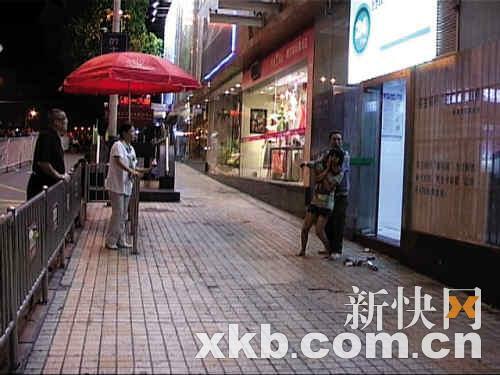 Last evening at around 8pm, a 38-year-old man named Xie robbed a man south of the train station in Guangzhou city. The victim resisted and Xie used his scissors to stab him. 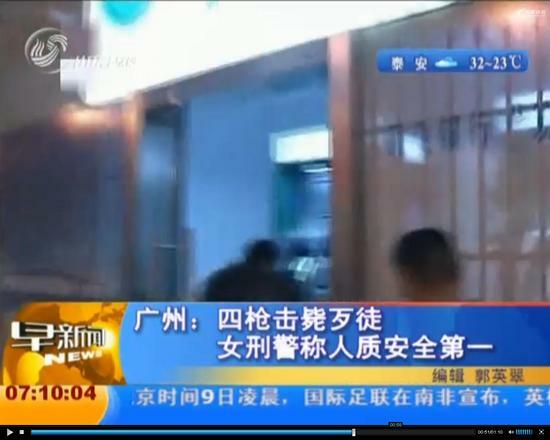 The police set off after Xie once they received reports. 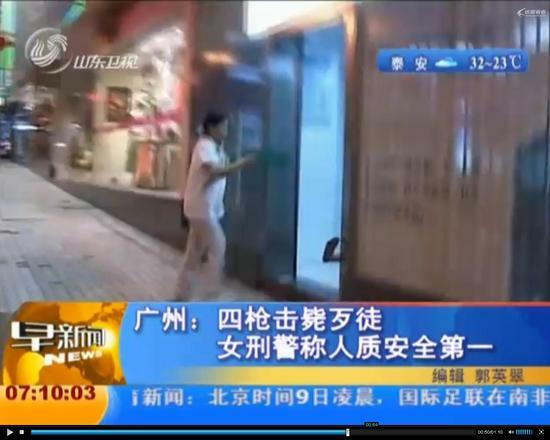 At 8:30pm, Xie got to the intersection of Liuhua Road and started waving his scissors. The police ordered him to put down the scissors. 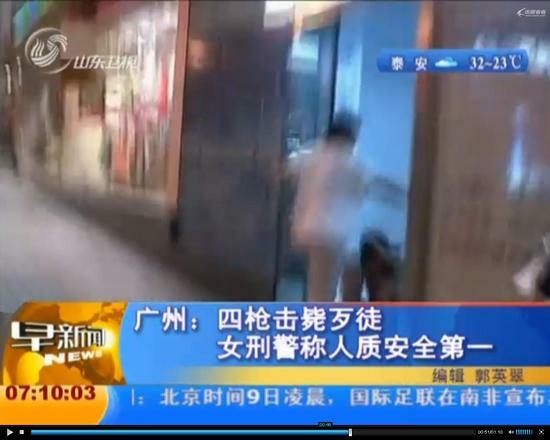 But Xie ran towards the train station. 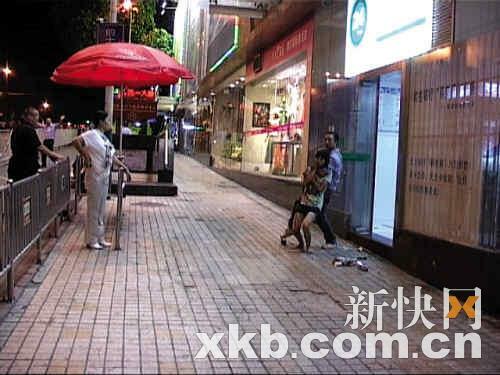 When Xie got to the bus stop, he grabbed a young woman who was waiting for a bus. 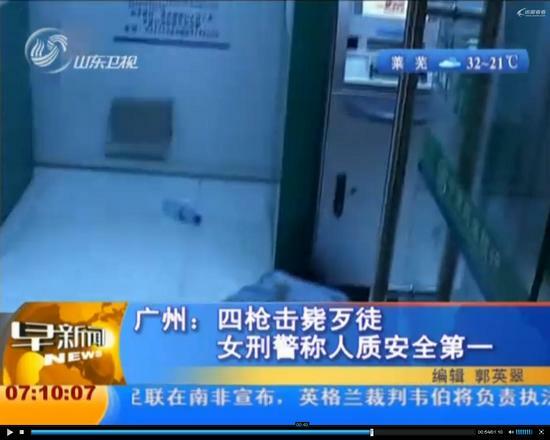 With his right hand holding the scissors and his left hand around the young woman's neck, Xie entered a ATM office. A large number of police officers sealed off the scene for the negotiators to work. 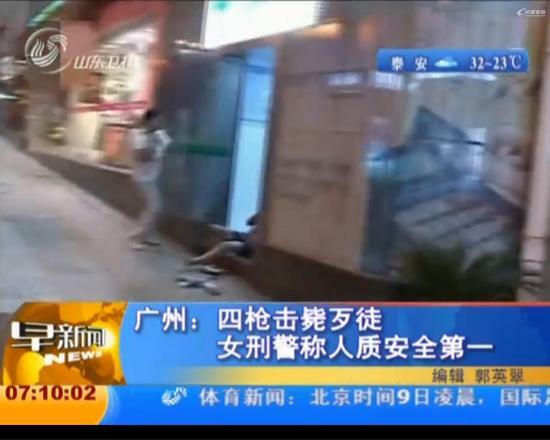 At 8:50pm, the police specialists arrived at the scene. It was reported that snipers were posted at the scene. At 9pm, our reporter arrived at the scene and observed a man with a crew-cut hairdo wrapping his left arm around the neck of a young woman while holding a knife aimed at her throat. She looked no older than 20 and in a lot of distress. The man then started speaking to a policeman 20 meters away. The policeman "invited" the man to talk to him, trying to calm him down and persuade him to put down his weapon. 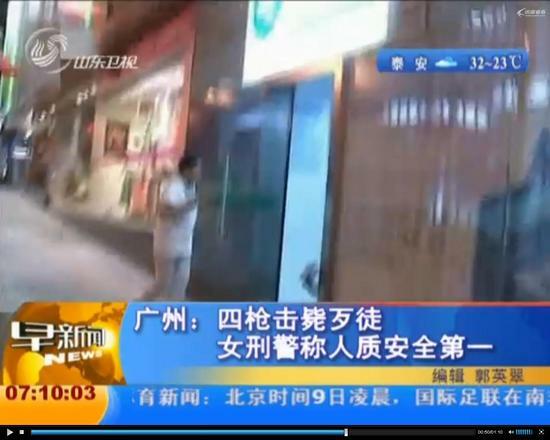 Several other policemen tried to edge near Xie. At 9:10pm, Xie was clearly getting agitated. He yelled loudly and stabbed the young woman in the hands and legs to make his point. The woman looked dazed while blood covered the right half of her body. She was unable to say anything. The police moved the police line backwards to give more room. By now the spectators were watching what the policeman in front was doing. They said to themselves, "The police are going to use force." 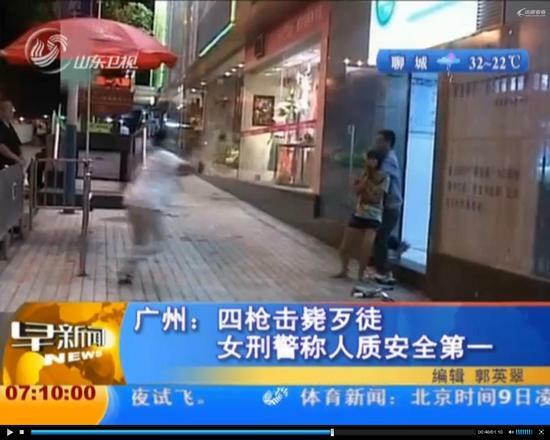 At 9:25, a short woman with a pony tail and white t-shirt came up to offer a beverage bottle. She threw the bottle on the ground in front of Xie. 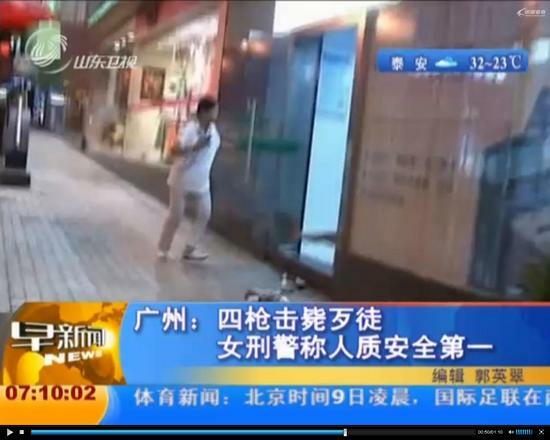 When Xie bent down to pick the bottle, the pony-tailed woman reached for a pistol on her hip and fired a shot at Xie. 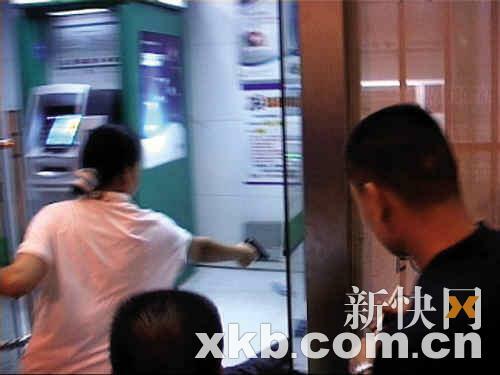 When Xie fell backwards into the ATM office on impact, the pony-tailed woman went up and fired three more shots. The whole action took only three seconds. 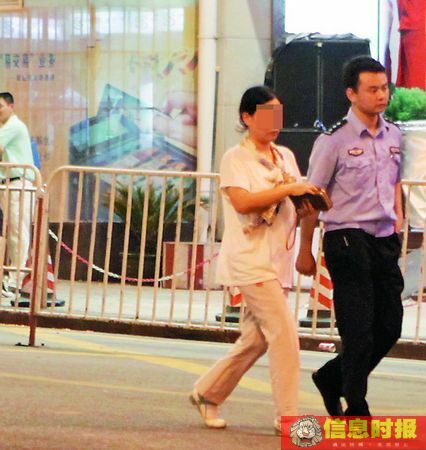 Police officer rushed to retrieve the hostage and sent her off to the hospital in an ambulance. At 9:50pm, the deceased robber was taken away. Five minutes later, traffic was re-opened in the Liuhua district. 48th second: The first gunshot sound. The suspect begins to retreat with his right foot on the step. There is no sign of bullet impact on his body. while he instinctively turns his body and hides his head behind the hostage. There are no signs of splattered blood. 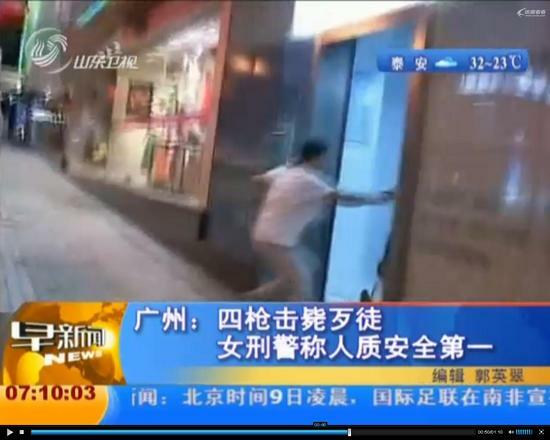 48th second: The suspect turns his body completely and uses his left hand to drag the hostage inside the ATM area. However, his left foot trips on the step and his momentum makes him fall towards the ground. Still no sign of splattered blood. with both hands in front of her chest. This meant that the suspect still had his left hand around her neck. 49th second: The hostage is completely on the ground. The suspect has probably fallen on the ground face down. 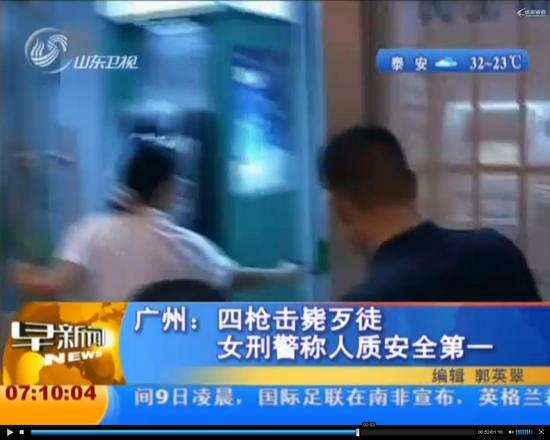 The policewoman has her left hand on the door and propels her body forward using her right leg. 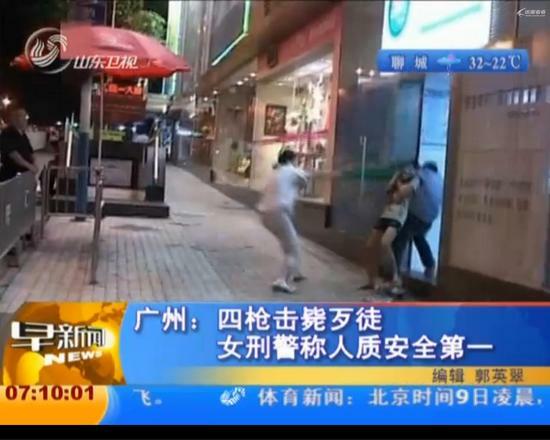 49th second: The policewoman is on the move while the hostage legs are rapidly curling. is ready to get up. The hostage is being drawn inside the ATM space. so she is probably trying to sit up. The suspect is not within view. Two shouted orders of "Open fire" can be heard in the background. 50th second: The hostage's right leg is completely in the air. 50th second: The hostage right leg is starting to come down, which means that she has sat up. 50th second: The second gunshot sound. The hostage's right foot is not yet on the ground. that is taller than the hostage. The suspect is taller than the hostage to begin with. The suspect fell down face first on the ground while the hostage fell backwards. In order to get up, the suspect needs to stand up higher than the hostage. 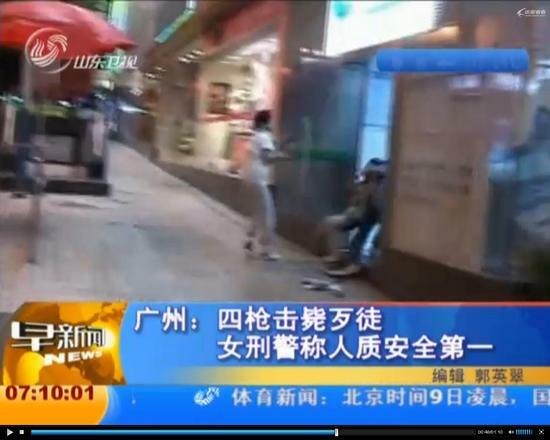 Therefore the suspect has stood up and is in a position to attack the hostage who is still sitting on the ground. shot was on target and the suspect has fallen down on the ground once again. The hostage has sat up. This is the normal sitting position of someone who had just fallen backwards on the ground. 51st second: The third gunshot sound. The direction and angle could not be seen in this video. 52nd second: We hear a shout of "Good." It was likely to be an order to stop shooting. 52nd second: Before the shout even finished, there was a fourth shot. This is a photo of the dead suspect. As expected, he fell down face first on the ground. He got back up. But before he even turned around, he was shot again and fell down once. There are two gun shot wounds on this back, one right and one left. When I watched the video, I found some problems. 1. 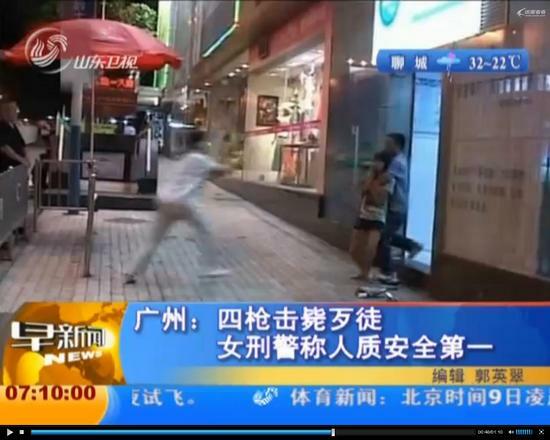 The suspect fell down on the ground after the first shot. 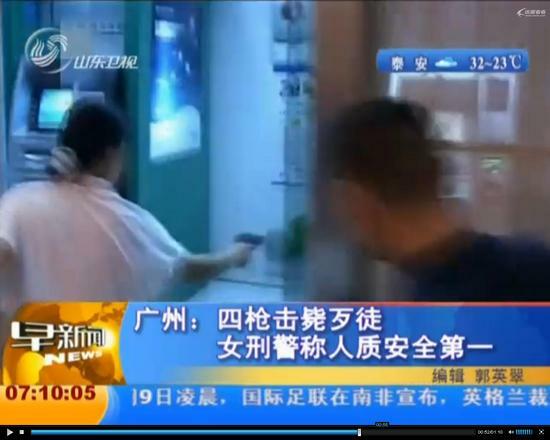 The policewoman was already next to the hostage and had enough time to rescue the hostage. The second shot was not made immediately after the first shot. The suspect was not holding a gun. Once he fell injured onto the ground, he was unlikely to use a sharp object to threaten the hostage. There was a time gap. He was not a regular criminal who was psychologically ready. 2. You may have spotted another detail. 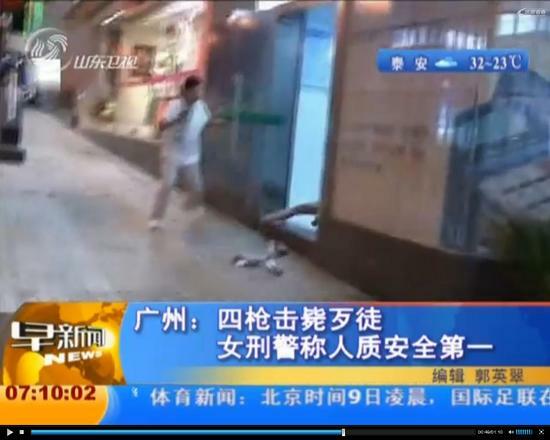 At the least, the fourth shot by the policewoman was fired at the suspect who was now lying face down on the ground. I wondered if the second shot was also fired while he was face down. He was unlikely to be able to move after being shot twice. After watching the video closely several times, I am sure that the suspect was face down during the third and fourth shots. If it was possible to arrest the suspect without killing him, then he should be kept alive. His crime does not deserve death. Even if he deserves to die, it should be decided by the judiciary. The present action shows utter disregard for human life. I am not going to talk about human rights. There is no such thing as human rights in China. You make the suspect out like a hero and you say that the police was wrong to save the hostage? If you were the hostage, would you prefer the police do nothing? To sympathize with the evil people is to hurt the good people! If you were kidnapped yourself, would you be farting like this? Every time that a bad person gets shot, there will always be some hypocritical dogs who jump out and bark? I firmly support this post! No wonder western nations look down on human rights in China! What is the duty of the policewoman who fired the shots? What were you there for? Everybody knows: To rescue the hostage! When your first shot hit the suspect, the hostage was basically rescued. That is to say, your mission was accomplished. You can take his scissors away and place him under control. Although a kidnapper is a criminal, you have no right to terminate his life. Where is the law? Are you the law? What do we need courts for? What do we need prisons for? Aren't you an ace marksman? Shoot the suspect with one shot then. If you were in her place, you might have fired ten shots instead. Please let those who are raising doubts here send their family members in as hostages. Then they can gently remind the police officers: "This suspect has only stabbed the hostage several times. You ought to refrain from shooting. If you have to shoot, you should fire as few shots as possible." So many "experts" are criticizing the police action. Can they sign up with the public security bureau so that the next time there is an emergency, these "experts" can be summoned to study the video frame-by-frame and solve the crisis? If these "experts" are taken hostage, will they be able to explain? After the first shot, should the "experts" analyze the video frame-by-frame first before deciding to fire the second, the third and the fourth shots?